In Spanish las lajas means “the rocks.” This image was imprinted on the rocks of a gorge above the Guaitara River in Colombia near the border of Ecuador. It has the singular characteristic of having been made by Angels. The image is situated inside a cave very high in the mountains, and was completely unknown until it was discovered in the mid-18th century by an Indian (see the history below). It is not painted, but mysteriously imprinted in the rock. The colors are not applied in a surface layer of paint or other material, but penetrate deep into the rock. No one knows how the work was done. Certainly it has no natural geological cause. I have never heard of any case where nature reproduced human faces with such perfection. The image represents a noble Lady from an uncertain period, most probably 16th or 17th century Spain. How such a picture came to be in that cave unnoticed by anyone remains a mystery. These circumstances seem to indicate that it is an akeropita image – akeropita in Greek means not made by human hands, id est, made by the Angels. How can the beauty of this image be described? I will comment on two aspects: the colors and the persons. The ensemble of colors in the picture gives an undeniable idea of majesty. 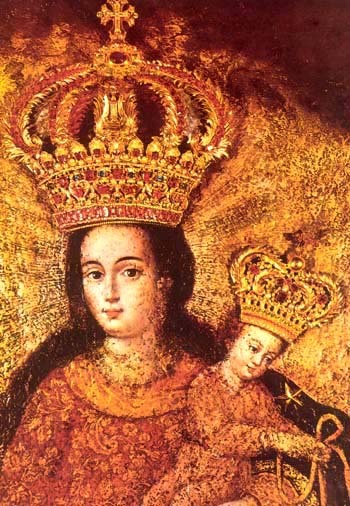 The colors behind Our Lady's head create a splendorous background. The burgundy of her dress is a warm, rich red embroidered with a golden flower pattern, giving the impression of the garment of a Queen. Her long hair flows freely in such a way that it appears to be a royal mantle. In my opinion, there is extraordinary good taste in the way the hair is arranged, which reinforces the notion of majesty. The two crowns are very beautiful, rich and royal, but I think they are a little too large for the proportion of the heads. They were added by the faithful later in thanksgiving for graces received. Now, we can look at Our Lady’s face and observe how she watches us from on high with a serious probing gaze. She is not smiling. She has the royal physiognomy of a person who imposes respect with confident strength. In contrast, the Divine Infant is very amiable and is turned toward the supplicant. Thus, instead of having the classic picture of a serious Child and a smiling Mother, here we have the opposite. One could say that He is distributing the gifts while she appears as a Queen. In reality, there is something profound in this contrast. It is the idea that He is merciful because He is seated in Our Lady’s arm. He communicates to the person who prays a little of His happiness to be with her. Is there some thing strange about the Child? It seems to me that He is very small in size. His face and attitude are those of an older boy, notwithstanding the small size. Is this a mistake or is it meant to express something? It appears that it expresses His wisdom at each stage of His life. He did not have the weaknesses or lack of reason of a normal child. His wisdom was perfect at every age of His life. So, what the image expresses is that even when He was very small, He was already conscious of everything He did, as an older boy would be. After having considered the Child, if we return our eyes to Our Lady we can see how the image expresses motherhood. She is not looking at Him directly, but she has an enormous intimacy with Him. She extends this maternity to the sinner who kneels before her. She is also his Mother. This image is a masterpiece reflecting both the majesty and the maternity of Our Lady. 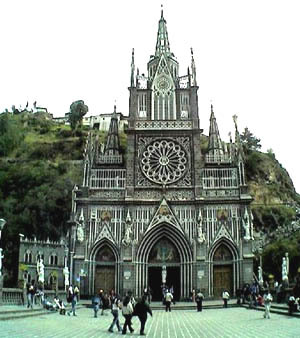 The Sanctuary of Our Lady of Las Lajas was built high in mountains of Colombia. 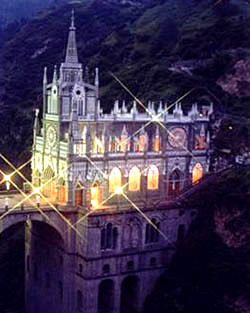 Below, the Sanctuary entrance, which leads to the cave with the miraculous image of Our Lady of Las Lajas. Historians and scientists are at a loss to explain this fabulous image on the wall of a South American cave. It may forever remain an enigma. Back in the 18th century, Maria Mueses de Quinones, an Indian woman from the village of Potosi, Colombia, often walked the six miles between her village and the neighboring one of Ipiales. 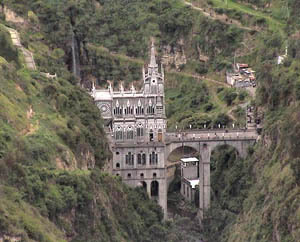 One day in 1754 as she was making the journey, she approached the place called Las Lajas (the Rocks), where the trail passes through a deep gorge of the Guaitara River. Maria never liked this part of the trail. There were rumors that a cave in Las Lajas was haunted. Such superstitions lingered amongst the converted Christian Indians. She was carrying her daughter Rosa, a deaf-mute, on her back in the Indian fashion. By the time she had climbed to Las Lajas, she was weary and sat on a rock to rest. The child got down from her back to play. After a while, Rosa emerged from the cave shouting: “Mama, there is a woman in here with a boy in her arms!” Maria was beside herself with the fright since this was the first time she had heard her daughter speak. She did not see the figures the girl was talking about, nor did she want to. She grabbed the child and hastened on to Ipiales. When she recounted what had happened, no one took her seriously at first. However, as the news spread, some asked if perhaps it were true. After all, the child was now able to speak. A few days later, the child Rosa disappeared from her home. After looking everywhere, the anguished Maria guessed that her daughter must have gone to the cave. The child had often said that the Lady was calling her. Maria ran to Las Lajas and found her daughter in front of a noble Lady and playing affectionately with a Child who had come down from His mother’s arms to let the girl enjoy His divine tenderness. Maria fell to her knees before this beautiful spectacle; she had seen the Blessed Virgin and the Divine Infant. Fearful of ridicule, Maria kept quiet about the episode. But she and Rosa frequently went to the cave to place wild flowers and candles in the cracks of the rocks. Months went by, with Maria and Rosa keeping their secret. Finally, one day the girl fell gravely ill and died. A distraught Maria decided to take her daughter’s body to Las Lajas to ask the Lady to restore Rosa to life. Moved by the sadness of Maria’s unrelenting supplications, the Blessed Virgin obtained Rosa’s resurrection from her Divine Son. Overflowing with joy, Maria returned home. It was not long before a crowd had gathered to hear what had happened. Early the next morning everyone went to Las Lajas, each one wanting to check the details for themselves. 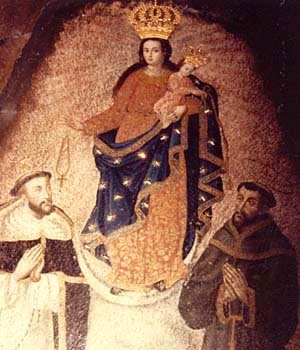 That was when the marvelous picture of Our Lady on the wall of the grotto was discovered. Maria Muese de Quinones could not recall noticing it until then. The Child Jesus is in Our Lady’s arms. On one side of Our Lady is St. Francis; on the other is St. Dominic. Her delicate and regal features are those of a Latin American, perhaps an Indian. Her abundant black hair covers her like a mantle (The two-dimensional crown is metal and was added by devotees much later on). The Indians had no doubt: this was their Queen.